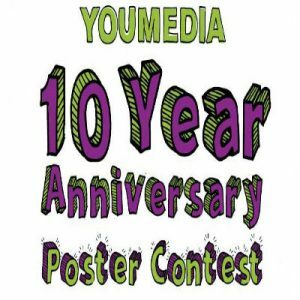 Teens and YOUmedia alumni, enter our YOUmediaopens a new window 10 Year Anniversary Poster Contest! Winning designs will be reproduced and displayed throughout the city as part of the #YOUmediaYear10 celebration. Original poster designs are due by May 15 and must be submitted using the form below. The design should represent what YOUmedia means to you and the Chicago community, and the name YOUmedia should appear somewhere on the poster. Ten finalists will be selected by Chicago Public Library staff and notified by May 23. Submissions will be judged on originality, aesthetic quality and impact. Please enter a value between 14 and 28. Please use an email other than a Chicago Public Schools email address. CPL reserves the right to share submitted creations on our website and social media. Maximum file size - 5 mega bytes. Allowed file extensions - jpg. All 10 finalists will receive a Chicago Public Library swag bag. Three grand prize winners will be selected in the categories of People’s Choice, Alumni Selected and Juried Prize. Grand prize winners will be notified by the end of May. These grand prize winners will receive a $100 prize and prints of their posters. People’s Choice: Chicago Public Library patrons will vote on their favorite design from the 10 finalists May 28 to June 11. Alumni Selected: The YOUmedia Alumni Committee will select a winning design based on originality, aesthetic quality and impact. Juried Prize: A jury of Chicago Public Library staff will select a winning design based on originality, aesthetic quality and impact. Disclaimer: By submitting your design, you authorize Chicago Public Library to post your work on www.chipublib.org.